2014 is a brand new year for the Acura MDX with a complete redesign that has increased fuel economy, provided passengers with a higher-quality—not to mention quieter—cabin, and a new control interface. With a sleek profile that has a much more curvaceous than previous models, the 2014 Acura MDX makes a leaner, more appealing silhouette than ever before. The front grille has a simple design that doesn’t grabble for attention, which is what makes this crossover so appealing. It has a reserved styling that whispers, “Practical, but luxurious,” rather than making a scene in order to coerce people into taking a second glance. A 3.5-liter V6 engine powers each 2014 Acura MDX, churning out 290 horsepower and 267 lb-ft of torque that makes driving the SUV fun. All-wheel-drive is an available option for those who might be more interested in going off the beaten track, though front-wheel drive is standard along with a six-speed automatic transmission. 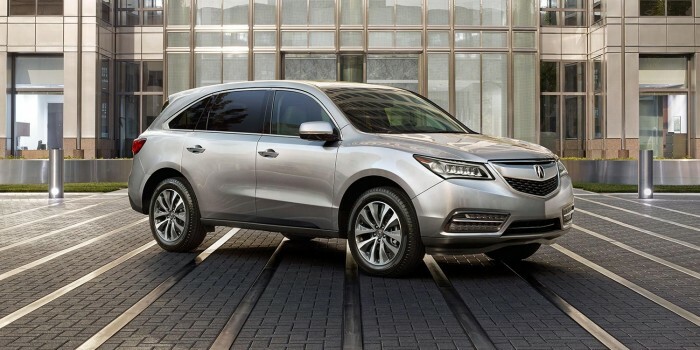 The 2014 MDX gets an EPA-estimated 23 mpg combined with the front-wheel-drive and 21 mpg with the all-wheel-drive. For the 2014 model year, the redesigned cabin has higher grade materials and a design that keeps the driver in mind with a thick, leather-wrapped steering wheel and easy-to-read gauges. Two display screens and a nice, clean layout has made the center stack simpler, adding a luxurious feel to the interior that wasn’t there before. A third row doesn’t diminish the legroom in the back seats, while power-sliding second-row seats makes getting in the third row as simple as pushing a button. Standard safety equipment and optional safety features come together in the 2014 MDX to create a crossover that will work to keep your family safe. Antilock disc brakes, front-seat side airbags, side curtain airbags, a driver’s knee airbag, and traction and stability control come standard on the MDX, along with a multi-angle rearview camera. Optional features include some great safety technology like lane-departure and blind-spot warning systems.